There is no doubt that the transcontinental premium market is turning over a new leaf in terms of service, product and amenities. Flat-bed seats are now the norm, with improved catering and other benefits for passengers. 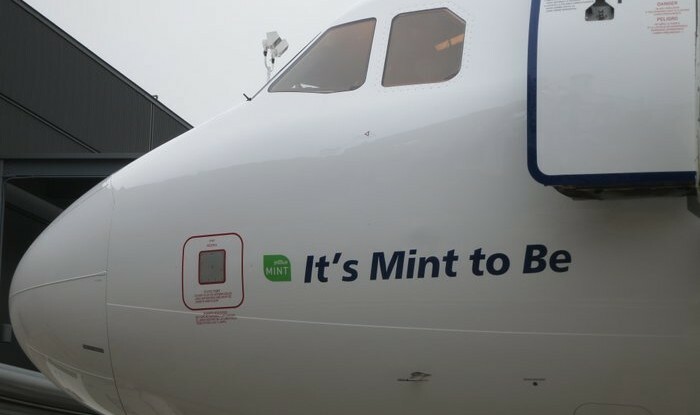 JetBlue Airways enters the market this week with its Mint offering – 16 flat-bed seats including four mini-suites; the only such product on offer in the USA. JetBlue’s seat breaks from the mold. While its three main competitors have essentially chosen the same business class seat, JetBlue went with a different option. Based on the Thompson Aerospace Vantage seat, the JetBlue offering is customized with extras like increased storage and dual power outlets (110V+USB) at every seat and four mini-suites which include a sliding door for privacy; it is the only “completely separate single suite seat” being offered in the market. The inflight experience is also somewhat different from the competition. There is a custom cocktail, for example, and the meal service involves a multi-course offering. 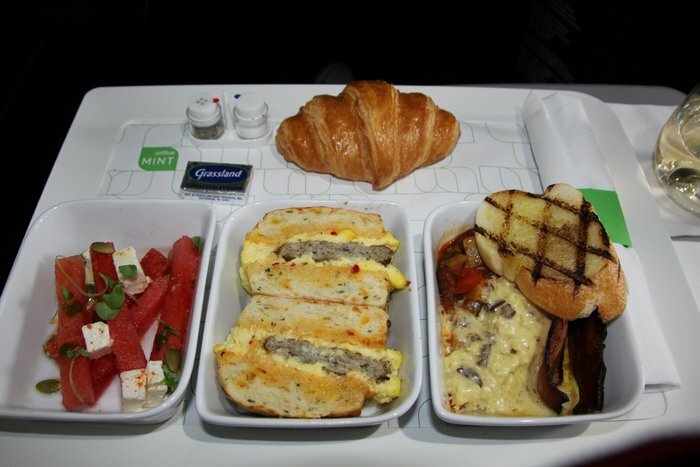 The airline has also taken a “small plates” approach to the dining. Passengers are given a choice of five offerings, and can choose three. None of these meals are similar in size to a full main course on the competition, to be sure, but with three on the plate the total amount of food presented is very similar to other carriers. And there are multiple flavors available; that’s definitely a nice change from the norm. This is very much a new offering for JetBlue and, to be certain, they are still smoothing out the rough edges (sometimes, literally). The IFE software doesn’t support the touch-screen capability yet, for example. And the ATC broadcast channel isn’t online yet, though that’s coming soon. 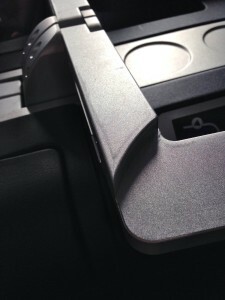 And as recently as this week the airline was refining latches and other details on the seat. JetBlue’s now popular Ka-band satellite-supported inflight connectivity solution, dubbed ‘Fly-Fi’, will also be offered, and JetBlue revealed today it will extend the beta test period for the product for at least a few more months (which means free Wi-Fi for now…and possibly a free element down the road). Mint is a product that is very, very good, but it is also a product that still has much potential. In a market where copying the competition is the trend JetBlue continues to take a different tack. That is good news for passengers. 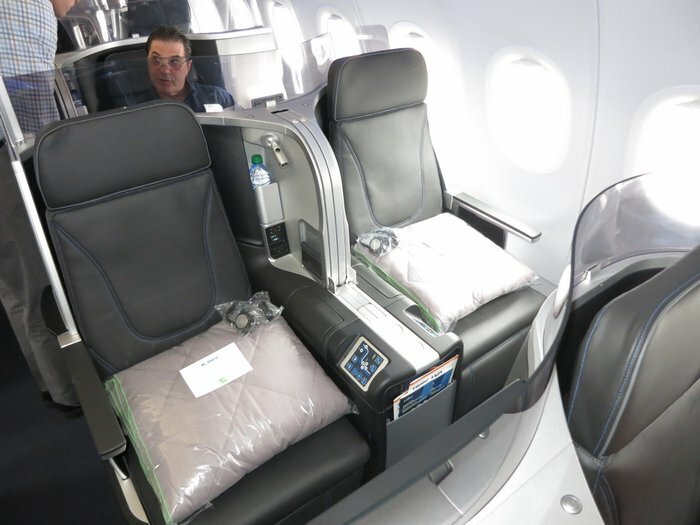 Meanwhile, JetBlue has customized B/E Aerospace’s popular Pinnacle economy class seat; it is offering 33 inches of pitch in the main cabin and up to 37 inches of pitch in its ‘Even More Space’ extra legroom product. 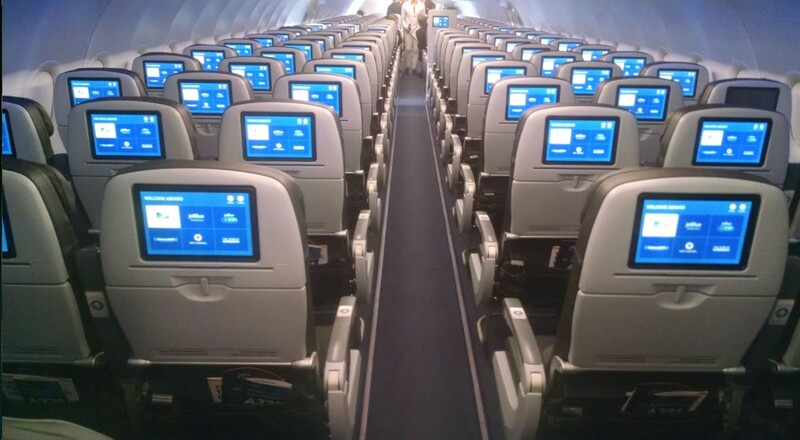 The company has also upgraded the IFE to include the most live TV channels of any airline and closed captioning on all channels. Also, where available SAP (second language) programming is included, offering second language audio on the system. See more pictures from today’s event. Correction: the even more space seats actually have at least 37″ of pitch. Plus, the even more space seats in the exit rows give you a full 41″ of pitch. That’s probably a record amount for both a premium coach seat on a US airline and an economy plus type seat in the world.